one way beginning at either end. The Strait of Juan de Fuca Scenic Byway is located on the Olympic Peninsula, the most northwestern tip of Washington state. By vehicle, the byway is about a 3 hour drive from Seattle. There are several route options for getting on to the peninsula. Once you are here, follow the directions below to explore the byway. Be sure to print our downloadable map to bring with you. Follow Highway 101 either east or west over the Olympic Peninsula. If you are approaching from Port Angeles and Seattle (east), drive west on Highway 101 approximately 4 miles from Port Angeles to the junction of Highway 101 and SR112. You are now at the eastern entry to the Strait of Juan de Fuca Highway. If you are approaching from the west, watch for the junction of Highway 101 and SR113 at Sappho, approximately 11-12 miles east of Forks. Follow SR113 north to its junction with SR112 (approximately 10 miles). At that point you can either continue north to Clallam Bay/Sekiu and west to Neah Bay where SR112 begins, or you can proceed east at the 113/112 junction, taking SR112 to Joyce and Port Angeles. From Canada and Vancouver Island, visitors can also reach the byway by taking a ferry across the Strait of Juan de Fuca from Victoria, British Columbia to Port Angeles, WA. Starting on the west end of SR112, the Strait of Juan de Fuca Highway begins at Neah Bay (Milepost 0) and ends 61 miles east at its junction with Highway 101(Milepost 61). SR112 is used seven days a week by many industrial and commercial enterprises, so watch for logging trucks, buses and workers on the road. Use pullouts for stopping at views; never stop on the road or partially off the road. Keep alert for bicycles and motorcycles, and if you are riding one of these, also be especially vigilant. 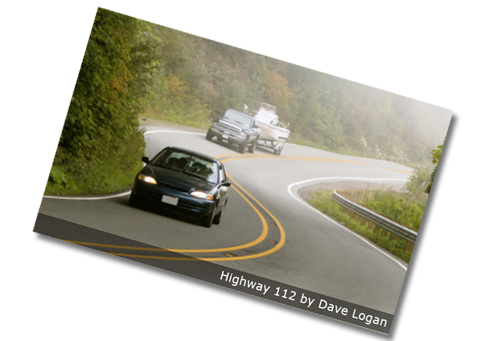 There are many blind curves and weather-related hazards, and sometimes very little or no shoulder. The general speed limit on SR112 is between 40 and 50 miles per hour west of Joyce, unless otherwise posted or unless road conditions dictate a slower speed. For complete road information, please visit: Washington State Department of Transportation, tune to 511 on your car radio or watch for signs. Special Note: In remote areas, GPS devices can be highly inaccurate.